Government regulations allow HBC, Inc. to use information about your current telecommunications services to keep you informed of the latest products and services that will best meet your future needs. This information is labeled as Customer Proprietary Network Information (CPNI) and includes information on the types of services and features you use, the way we provide these services to you, as well as calling and billing records. To keep you informed about innovative service offerings, new packages, or improvements, we would like to obtain your approval to market different categories of service to which you do not currently subscribe. By federal law, you have the right, and HBC, Inc. has a duty, to protect the confidentiality of information related to your telecommunications services. When HBC, Inc. uses agents, contractors, or other companies to perform services on our behalf, we require them to protect your CPNI consistent with applicable law. HBC, Inc. does not disclose CPNI to any unaffiliated third parties for use in their own marketing. 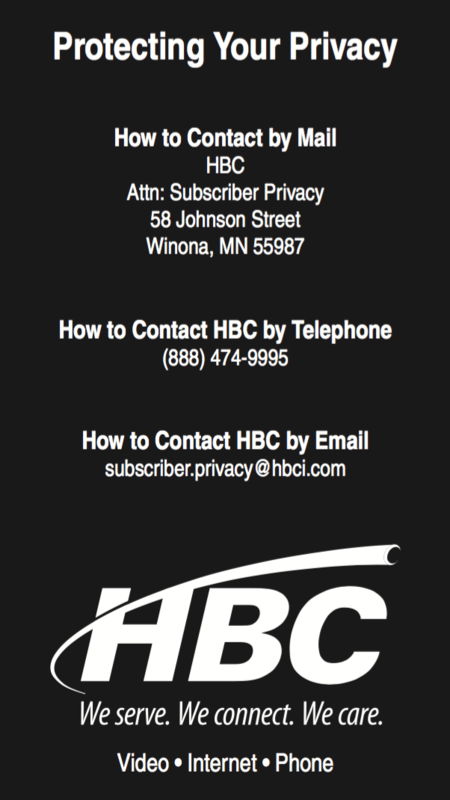 If you do not want HBC, Inc. to use your CPNI for purposes of marketing other HBC, Inc. communications- related service offerings to which you do not already subscribe, all you have to do is contact us. How- ever, if you do not respond within 35 days from receipt of this notice, your approval for HBC, Inc. to use your CPNI is assumed. Even if you have previously informed us about your CPNI election, we are required to seek your approval every two years. Your selection will be noted on your account and will remain in effect until you withdraw it. Additionally, customers who wish to reverse their previous decision to opt-out, or who have not previously opted out but wish to do so, must also take action.